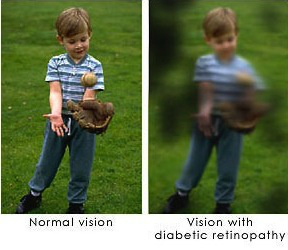 Diabetic retinopathy (DR) is an eye condition where the retina is damaged due to diabetes mellitus (DM). If left untreated it can lead to extensive vision loss or even blindness. It is due to damage of the blood vessels in the eye which is caused by high blood sugar levels. Individuals with Type 1 diabetes are more at risk if there is poor glucose control. Other signs that an Ophthalmologists/ Optometrist may find during an eye exam including swelling of the retina, traces of blood deposits or fluid leakages from blood vessels.They then may refer for further tests if they deem it necessary. If diagnosed with diabetes, see an Optometrist or an Ophthalmologist once a year for a dilated eye examination. It is also recommended to have your eyes evaluated shortly after a diabetic diagnosis is made. 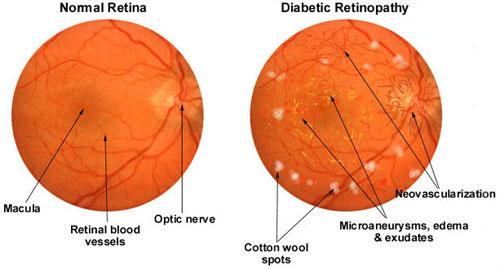 Diabetics unable to control blood sugar levels are most at risk of diabetic retinopathy. Women who develop diabetes during pregnancy are also at higher risk of developing diabetic retinopathy. African-Americans have double the risk of going blind due to diabetic complications, particularly at a young age. Other minorities are also at higher risk including Hispanics and Latino. Anyone with a family history of diabetes; either type 1 or type 2 are also at risk of themselves developing diabetes. Often if type 2 diabetes develops, it is firstly detected during a routine eye exam. This is why it is important for regular dilated eye examinations for anyone who may be at risk. With regular check-ups and proper treatment, diabetic retinopathy is a condition that can be prevented or curtailed. By controlling blood sugar levels and attending all regular check ups, the possibility of diabetic retinopathy can be reduced. Diabetics in Ireland who have poor vision may be able to register with the National Council for the Blind in Ireland (NCBI) which permits them to avail of certain services and statutory benefits.